What you get from R + H2O + Spark? R is great for statistical computing and graphics, and small scale data preparation, H2O is amazing distributed machine learning platform designed for scale and speed and Spark is great for super fast data processing at mega scale. So combining all of these 3 together you get the best of data science, machine learning and data processing, all in one. rsparkling: The rsparkling R package is an extension package for sparklyr that creates an R front-end for the Sparkling WaterSpark package from H2O. 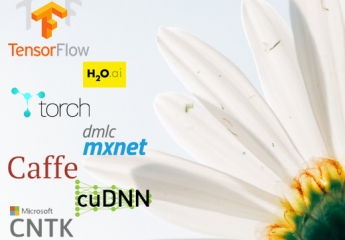 This provides an interface to H2O’s high performance, distributed machine learning algorithms on Spark, using R.
H2O is an in-memory platform for distributed, scalable machine learning. H2O uses familiar interfaces like R, Python, Scala, Java, JSON and the Flow notebook/web interface, and works seamlessly with big data technologies like Hadoop and Spark. Apache Spark is a fast and general engine for big data processing, with built-in modules for streaming, SQL, machine learning and graph processing. Sparkling Water integrates H2O’s fast scalable machine learning engine with Spark. With Sparkling Water you can publish Spark data structures (RDDs, DataFrames, Datasets) as H2O’s frames and vice versa, DSL to use Spark data structures as input for H2O’s algorithms. You can create ML applications utilizing Spark and H2O APIs, and Python interface enabling use of Sparkling Water directly from PySpark. If there is any issue with sparklyr and spark version pass exact version above otherwise you dont need to pass version. With H2O machine learning the best case is that your machine learning models can be exported as Java code so you can use them for scoring in any platform which supports Java. H2O algorithms generates POJO and MOJO models which does not require H2O runtime to score which is great for any enterprise. You can learn more about H2O POJO and MOJO models here. Above the MOJO model is stored into local file system as gbm_prostate_model.zip and it is loaded as resources inside the Scala code. The full execution of above code is available here. For logistics classification problem we use AUC metrics to check the model performance. The higher is better however any value above 80% is considered good and over 90% means the model is behaving great. AUC is an abbreviation for Area Under the Curve. It is used in classification analysis in order to determine which of the used models predicts the classes best. An example of its application are ROC curves. Here, the true positive rates are plotted against false positive rates. You can learn more about AUC in this QUORA discussion. We will also look for GINI metric which you can learn from wiki. In this example we will learn how AUC and GINI model metric is calculated using True Positive Results (TPR) and False Positive Results (FPR) values from a given test dataset. You can get the full working Jupyter Notebook here from my Github. Note: Above you will see that our calculated ROC values is exactly same as given by model performance for test dataset. Note: Above you will see that our calculated GINI values is exactly same as given by model performance for test dataset. What is R2 (R^2 i.e. R-Squared)? You can get the full working jupyter notebook for this article from here directly from my Github. Even when this article explains how R^2 error is calculated for an H2O GLM (Generalized Linear Model) however same math is use for any other statistical model. So you can use this function anywhere you would want to apply. Above we can see that both values, one give by model performance for test data and the other we calculated are same. Sometimes you may want to store the H2O model object as text to local file system. In this example I will show you how you can save H2O model object to local disk as simple text content. You can get full working jupyter notebook for this example here from my Github. Based on my experience the following example works fine with python 2.7.12 and python 3.4. I also found that the H2O model object tables were not saved to text file from jupyter notebook however when I ran the same code form command line into python shell, all the content was written perfectly. Note: If you are thinking what “!” sign does here, so it is used here to run a linux shell command (in this case “cat” is the linux command) inside jupyter cell. In this example we will launch H2O machine learning cluster using pysparkling package. You can visit my github and this article to learn more about the code execution explained in this article. cloudName            : Not set yet, it will be set automatically before starting H2OContext. If you into competitive machine learning you must be visiting Kaggle routinely. Currently you can compete for cash and recognition at the Porto Seguro’s Safe Driver Prediction as well. I did try to given training dataset (as it is) with H2O AutoML which ran for about 5 hours and I was able to get into top 280th position. If you could transform the dataset properly and run H2O AutoML you may be able to get even higher ranking.